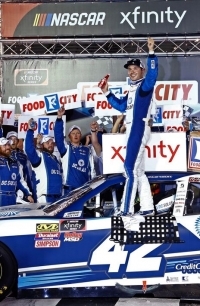 BRISTOL, TN – RIS – Kyle Larson won his first NASCAR Xfinity Series race of the season on Friday night at Bristol Motor Speedway. Larson took advantage of favorite Kyle Busch’s misfortune to get his first victory at the half-mile track that Larson calls his favorite. The race went into overtime after Daniel Hemric spun with two laps remaining. Larson held off a challenge from Justin Allgaier on the restart for the win. Allgaier ended up in third place, behind Christopher Bell. “We had the yellow with two to go and I thought `Man, again? I'm going to lose another one here at BMS’,“ Larson said. Although Larson had never won here before Friday, this marked his eighth top-10 finish in nine Xfinity Series races at Bristol. He has finished second on this track four times — at a Cup event earlier this year and at Xfinity Series races in 2013, 2014 and 2015. All four times, he lost to Busch, who has mastered this track throughout his career. Busch led for the first 70 laps Friday until he got a flat right front tire that caused him to hit the wall and damaged his car enough that he couldn't return. Busch was leading by over 3 1/2 seconds at the time he got the flat. Larson took command of the race immediately after Busch's exit. 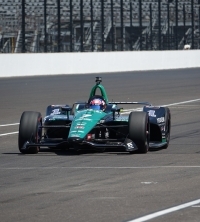 Larson won the first and second stages but fell to 12th place after pitting before the final segment. Bell was leading as Larson began working his way back toward the front. As Bell got held up in traffic, Larson managed to pick his way through and get back in front with 97 laps remaining. 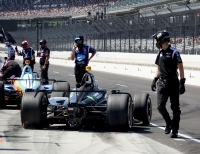 “The guy in second definitely has an advantage whenever you're getting through traffic, especially whenever you get the traffic going side by side,” Bell said. Busch was seeking to win both the Xfinity Series and Cup series races at Bristol in the same weekend for a third time. He had accomplished the feat in 2010 and 2017. During each of those two sweeps, Busch also won a Truck Series race in Bristol. This time, he didn't enter the Truck Series event, which was won Thursday by Johnny Sauter. Time of Race: 02 Hrs, 00 Mins, 27 Secs. Race Comments: Kyle Larson won the 37th annual Food City 300 at Bristol Motor Speedway, his 12th victory in the NASCAR Xfinity Series. Prior to the start of the race, the following cars dropped to the rear of the field under penalty for the reasons indicated: Nos. 93 (missing drivers meeting), 8 (tire change), 5, 45 (unapproved adjustments). 300-308 (No. 21 Incident Backstretch ).